A baby shower falls under the category of events for which there is no clear dress code. Usually celebrated during the day, this event often leaves so many of us unclear on how to dress and what to wear. Last time, we tapped an expert to discuss guest-appropriate attire for such an occasion, but today, we're turning our focus over to the center of attention at any baby shower—the mother-to-be. What exactly should an expectant mom wear to her own baby shower, you ask? While the possibilities are seemingly endless, a pretty floral dress that's equally comfortable and effortless is an ideal option in our minds. With moody florals predicted to be a strong trend this fall, there are so many pretty ones out there to choose from. 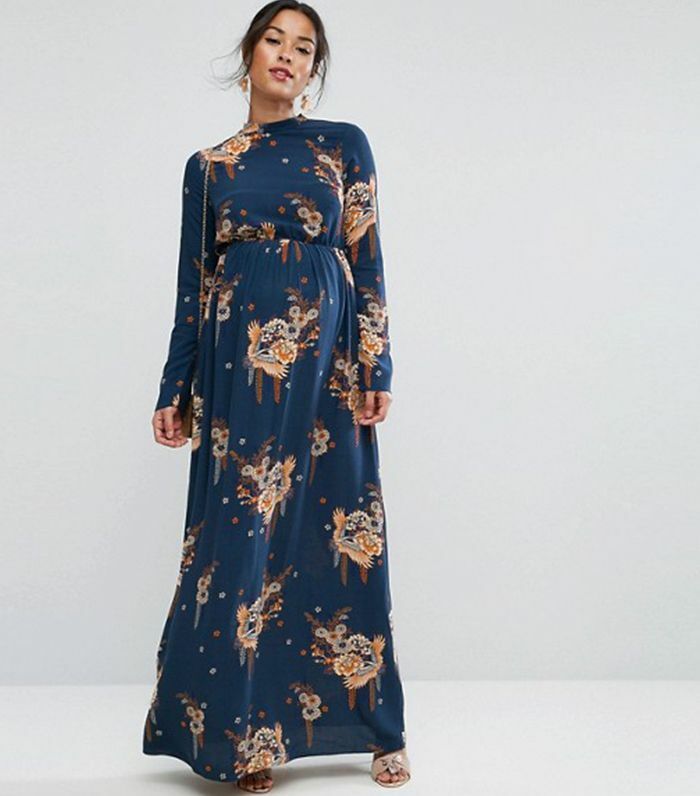 We've gathered the prettiest floral dresses, from maternity and non-maternity lines alike, that are perfect for a baby shower and so many more occasions to come! Keep reading to shop some of our favorites. The long sleeves and mock neck give this dress a very autumnal feel. Pair with a basket bag for maximum French-girl vibes. Florals are a neutral, right? We've never seen ruffles and a side slit done like this before. Wear just like this: with heeled ankle boots and hoop earrings. The perfect dress to show off your pretty bralette. Perfect for date night, too! This line has some of the cutest maternity clothes out there. You have to see the rest of its collection. Sheer poet sleeves make this dress ultra-romantic. An easy option that you can dress up with heels or dress down with sneakers. More of a shirtdress, so you'll definitely wear it everywhere else, too. Such a pretty slip dress option. All eyes on you in this gorgeous red number. The drop waist makes this dress the comfiest one you'll own. We love how the sheer skirt makes this dress perfect for a daytime event. A hint of Victorian vibes. For all your summer party needs. Can you ever go wrong with a wrap dress? The answer is no. Next up, where to shop for the chicest maternity clothes for everyday style.